I’m frequently in Mexico and this dish (particularly in Northern Mexico) is a popular breakfast dish. I made it this weekend without the Chihuahua Cheese (just didn’t have any) and upped the Crema Mexicana to about two thirds of the jar and it tasted just like what I have in Mexico. 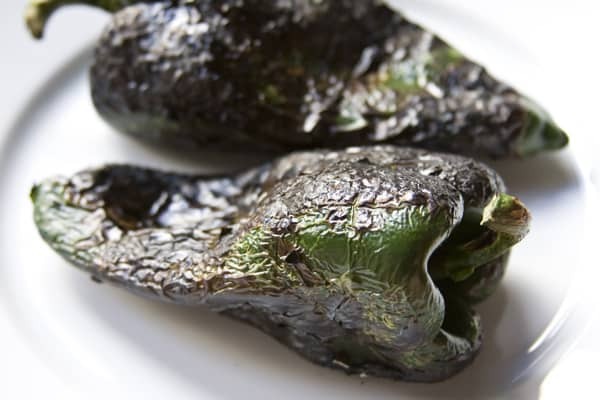 Some recipes don’t call for roasting the Poblanos, but I think it’s key to the dish. Just made this tonight for my husband, with a side of rice. It was delicious! Definitely going to be making it more frequently! Thank you for sharing! I’m so glad I found your site. I’m always told “You can’t cook Mexican food by recipe!” 😛 But this site is EXACTLY what I’ve been searching for in order to become a better! Monica, thank you so much for your lovely comment! So many of the family recipes that appear here are given to me in the “pinch of this” or “handful of that” style, which seems to be so common in most Mexican families. I know that a lot of people are too apprehensive to cook that way, so I’m glad my site can help others learn how to cook familiar dishes with actual portions. A lot of the time, there is guesswork involved, and sometimes I have to make a dish two or three times to get it right. Once you achieve a certain level of comfort in the kitchen, you’ll be able to operate on minimal directions, too. Thanks again, your comment really made my day! Thank you for posting this. It sounds delicious. Will be gathering the ingredients to make these today. Thanks for stopping by, Adam! I’m making them today, too. Let me know how you like them! Hola, me llamo Alexandra y vivo en la frontera entre EU y Mexico, en una pequena ciudad llamada Agua Prieta, Sonora. Me da mucho gusto haber encontrado tu sito para experimentar cocinar comida mexicana de Mexico, muy diferente a la comida mexicana de la frontera. Gracias por compartir con nosotros tus recetas. I can’t wait to try this one! Amanecí con un súper antojo de rajas con crema, compré los aditamentos y heme aquí﻿ preparándolas. Gracias a tu receta saldrán exquisitas! Se puede añadir un poquito de caldo de pollo en polvo y salen mas deliciosas. You refer to “the vinegar and water solution” for soaking the peppers, but I can’t see where you specify what kind of vinegar and what the ratio is of water/vinegar? Also how long do you soak them? And do you soak them AFTER they have been roasted, or before? Hi Peter, my apologies that it was not clear! I usually use just a tablespoon or two of white distilled vinegar diluted in about 4-5 cups of water if I soak the poblanos because they’re too spicy. About 15-20 mins of soaking should do the trick – you want them to lose some of the heat, but not all of ut. Hope this helps! If you find yourself in a jam, please feel free to head over to our facebook fan page at facebook.com/theothersideofthetortilla for quick help. I receive notifications via email whenever someone posts something on the wall there so that I can answer questions quickly. And I always answer questions via Twitter as well if you’re on there 🙂 Happy cooking! It is sooo hard finding a good/classic recipe for this. Thank you! When I lived in Mexico I would eat (phonetic spelling) moyeteeee con rajas most mornings. Awesome. Basically a small slice of french style bread with refried beans and then the rajas on top. I still make it this way about once a year when i need my moyeteee con rajas fix. Thank you mr. cafateria man in Torreon. I love rajas but have always made then fried in oil instead of butter. Tried your recipe today with only one addition – a few cloves of garlic with the onions. Taking them to a Cinco de Mayo gathering and am looking forward to seeing the reactions. Please tell me you know how to prepare cecina, that sounds excellent in this meal. We love RAJAS! My husband has made this dish as a regular treat for about 20 years. 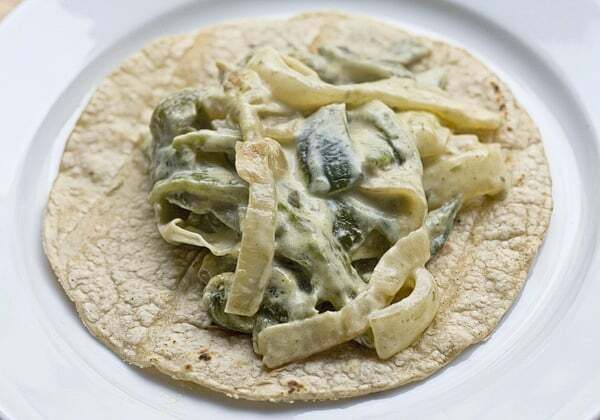 He doesn’t put cheese in but rather melts cheese onto a flour tortilla in the oven, then pile the tortilla with rajas and top with slices of avocado (I sometimes add sour cream if it’s too picante. He uses just heavy cream and then cooks it down quite a bit. He also starts by cooking the onions long enough that they are moving toward carmelized. This creates more sweetness to go with the spicyness. Thanks for posting! !